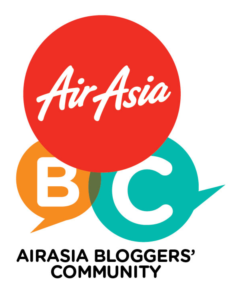 Quite a number of my friends and blog readers requested me to blog about this trip first instead of the rest. I guess most of them are more interested with my Europe trips compare to the other of trips of mine. 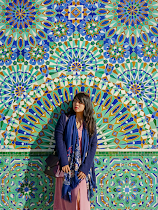 I will blog more about my trip around Istanbul once I done with Bosnia & Herzegovina and Croatia travelogues first. 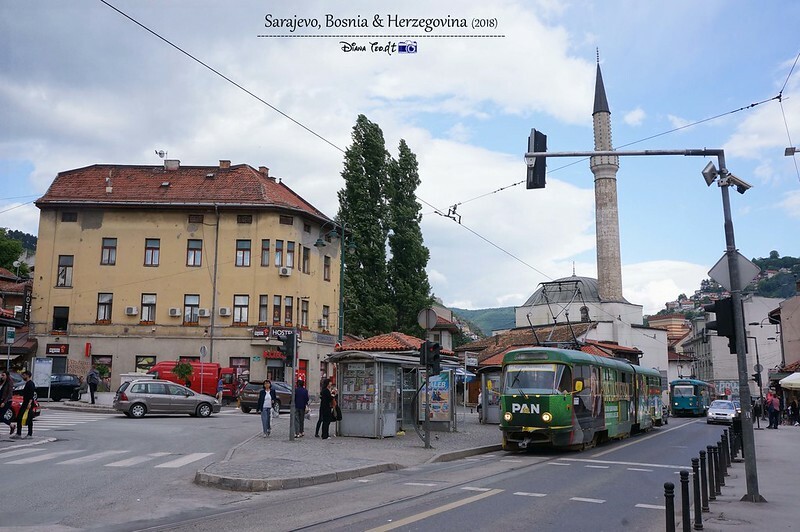 After staying for a night in Istanbul, I moved on to Sarajevo, the capital city of Bosnia & Herzegovina. The only mode of transportation to travel between these two cities are by flying. My friend advised me to search from Pegasus Airlines and I did, so at the end I got my ticket for 275 Turkish lira which including 20kg of baggage allowance. Bear in mind there are two different airports in Istanbul; Ataturk Airport and Sabiha Gokcen Airport. Make sure to check your airport cause these two airports are situated quite far away from each other. As for my case, my flight depart from Sabiha Gokcen Airport and I took Havabus from Taksim (one of notable Istanbul spots). You can check out for more here. 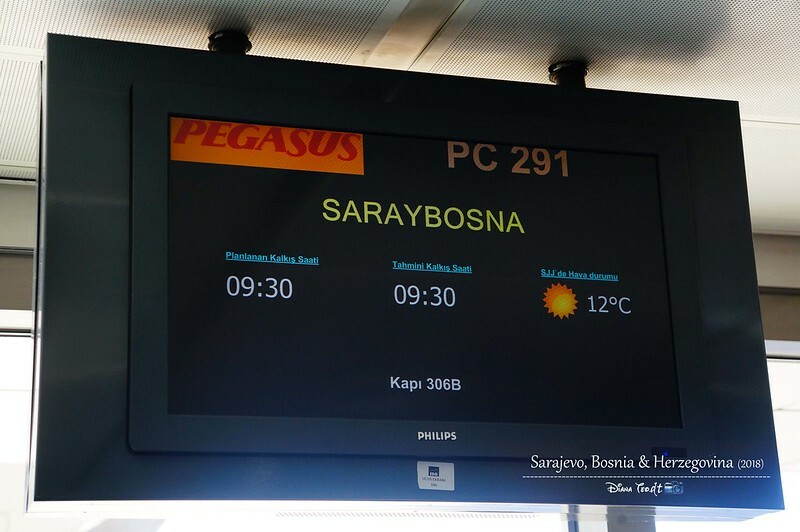 Because Pegasus Airlines is a Turkish low-cost airlines, which is similar to AirAsia, there is no complimentary meal being served unless you are willing to pay extra. After almost 2 hours on board, finally I landed in another new country again. 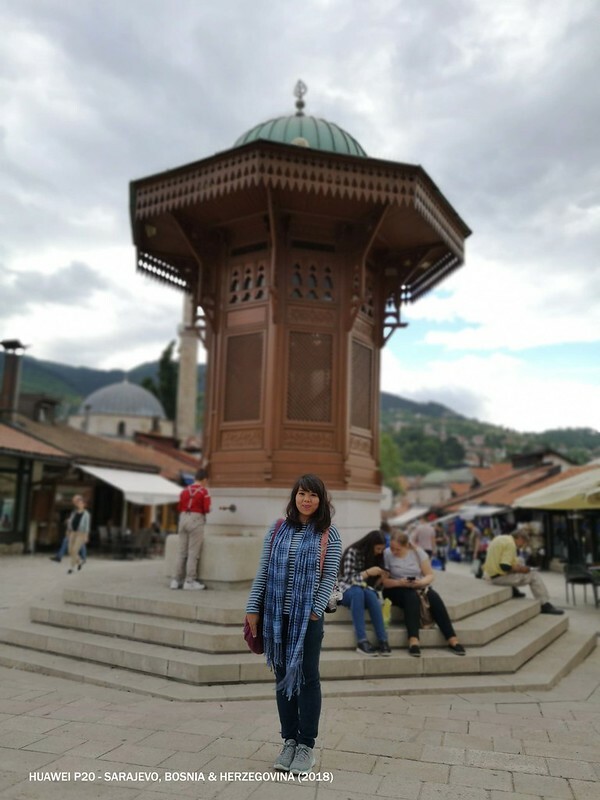 Frankly speaking, I was quite anxious and nervous cause I didn't know much about Bosnia, except for the heartbreaking civil war of the 1990s but deep in my heart, I told myself, "Hey, this is not your first solo trip to Europe. You did it last year!". That's how I comfort myself. Without thinking too much, I passed through the immigration clearance smoothly, claimed my backpack, exchanged some local currency and bought local sim card. 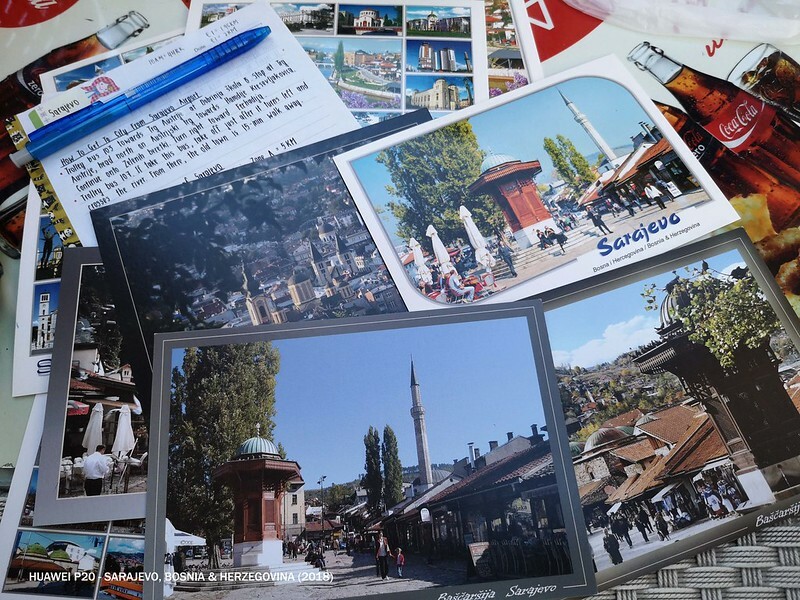 I did purchase Europe travel SIM card from Hello1010 before embark for this trip but unfortunately, it didn't cover Bosnia. 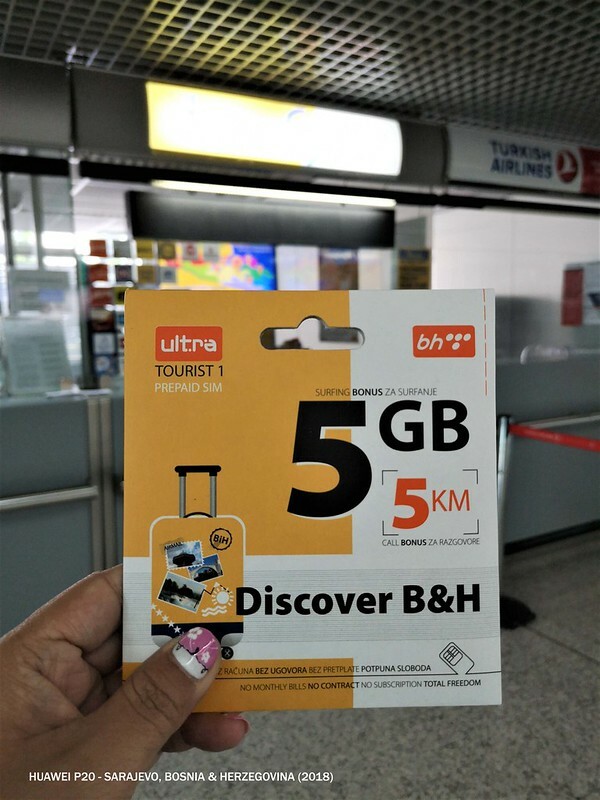 Therefore I decided to buy from the airport and this special SIM card for tourists costs 20 KM (approx. to €10/RM50) which valid for 10 days. Nowadays, prepaid sim card is my life saviour and I can't imagine how my travel would be without it. This is one of the most challenging journey throughout my trip. 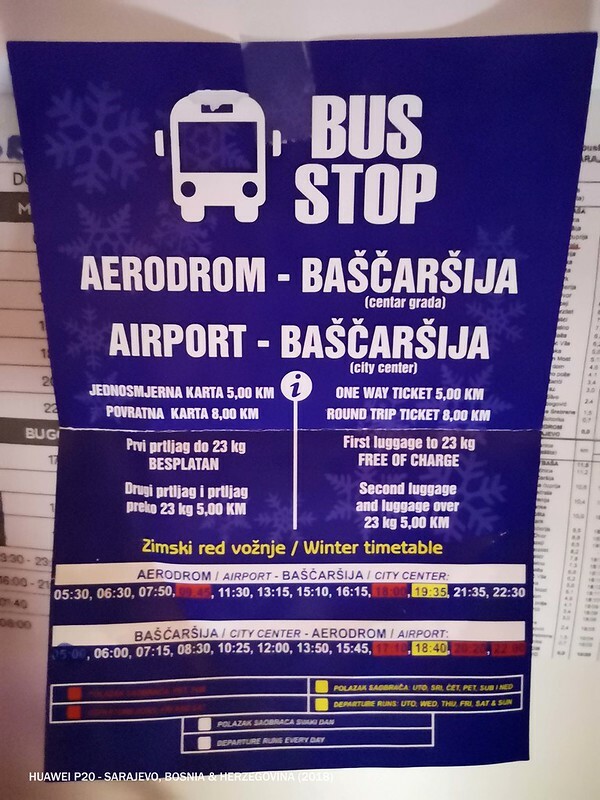 Previously when I did my research from Wikitravel and Lonely Planet, it mentioned the only way to get to the city center from the airport is by taking bus and this local bus can only catch in one of the bus stop situated 15-20 minutes walk from the airport. I even email the hostel asking for airport transfer and guess what, they quoted me for €20. That's insane! So at the end, I decided just to walk to that particular bus stop in order to save my money. Damn cheapskate me. After walking for almost 20 minutes under the dripping rain, finally I saw the "most wanted" bus stop. But funny enough cause after waited for almost 40 minutes, the particular local bus seems to be never arrive. I started to question myself whether am I waiting at the wrong bus. Somehow, life is always unpredictable. I met a local who can speak English fluently. She told me that the bus I waited for was not operating on that particular day due to some technical problem. Hence, she advised me to join her to the nearby tram station and from there, take the tram heading down to the town. She even invited me for a cup of Bosnian coffee before leaving. Guess this is a blessing in disguise. My bus never arrive but who will expect that I meet such a friendly and helpful local instead. 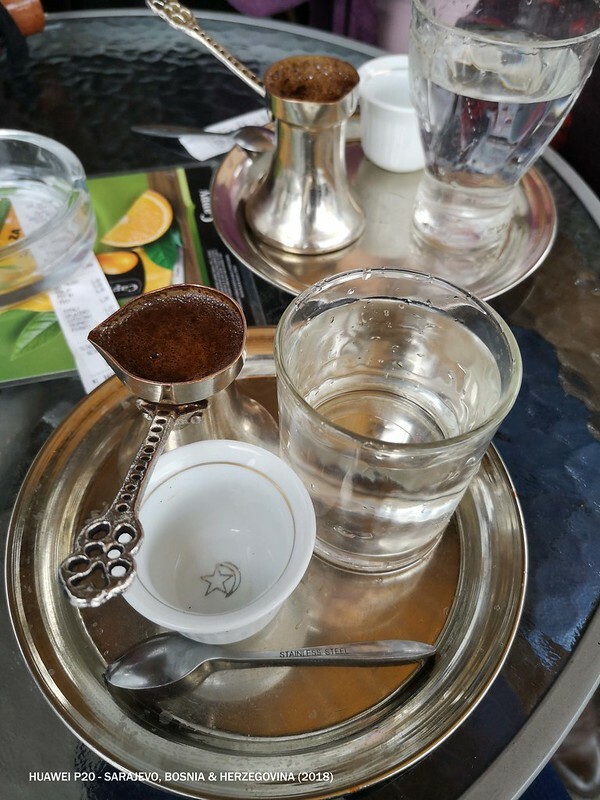 Not just the symbol of the country, Bosnian coffee is also a part of the Bosnian and Herzegovinian identity and tradition. Latest update for the airport transfer: Only on my last day I found out there is a direct bus from the airport to the city center. Wondering why the hostel staff didn't inform me about this at the first place when I email them? Old Town is always my favourite spot to stay and I chosen to settle down in Hostel Rania for good two nights. Nothing to complain about this hostel as the location is excellent, staffs are helpful and friendly and as for the room and bathrooms, both are fairly clean except for one thing, there is no personal socket within the bed. Except for taking the tram from nearby the airport and to the bus and train station, I explored the central area on foot as it is very compact and almost all of the attractions just right at my fingertips. In case you are lazy to walk a lot, hence you can consider to buy a day card for unlimited ride on all local public transport within Zone A for the cost of 5KM (approx. to €2.50/RM12) and this day pass can be bought from the newspaper stands. 1. 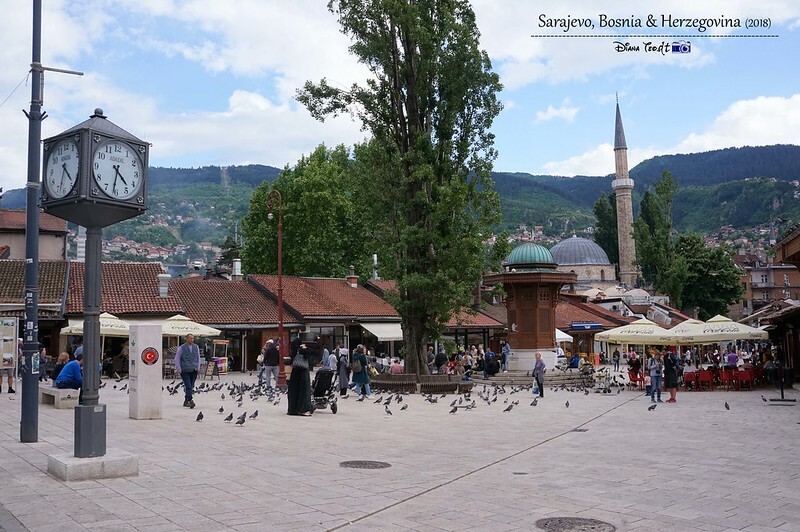 Sebilj (Fountain) - One of the city's most recognisable symbols, Sebilj is a pseudo-Ottoman style wooden fountain tucked neatly in the centre of the Old Town (Bascarsilja) square. 2. 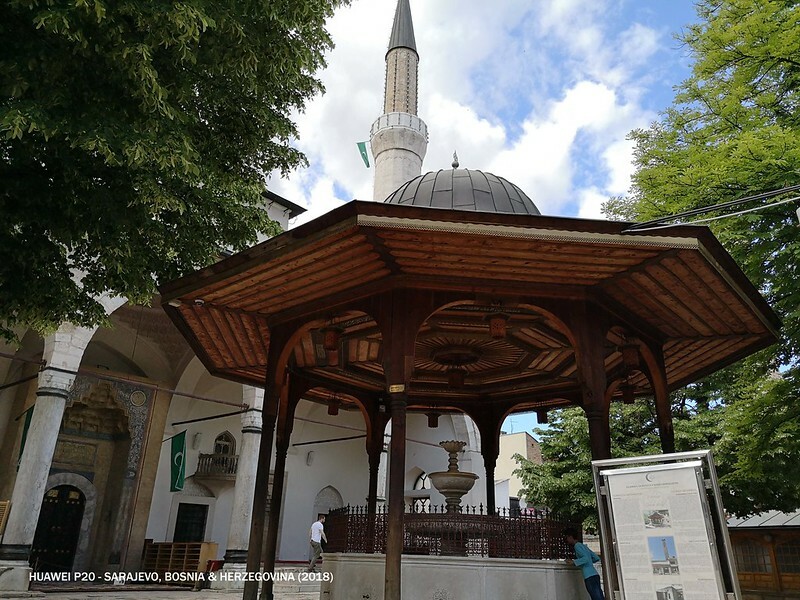 Gazi Husrev-beg Mosque - The largest historical mosque in Bosnia and Herzegovina and one of the most representative Ottoman structures in the Balkans. 3. 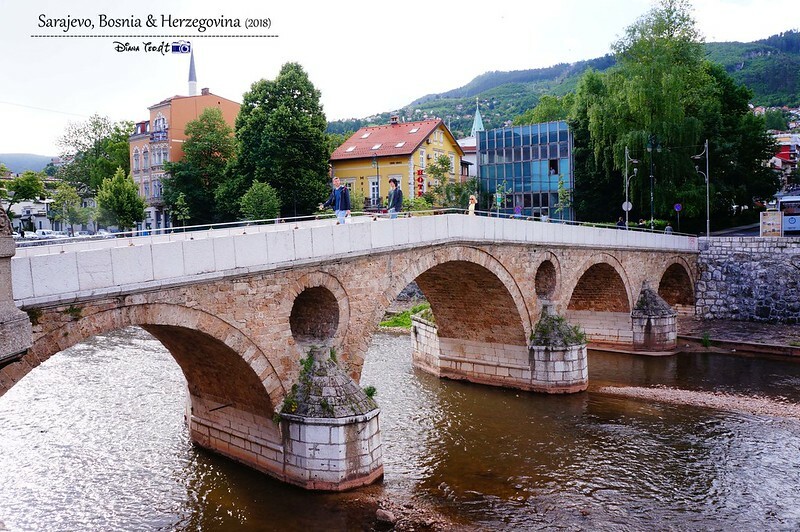 Latin Bridge - This bridge is believed that sparked the beginning of World War I due to assassination of the Austrian Hungarian empire Franz Ferdinard took place here. 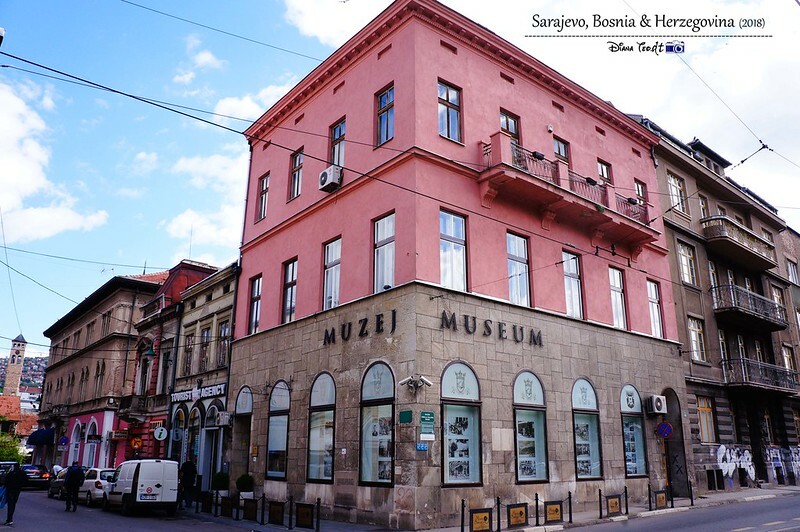 There is a small museum of Austro-Hungarian rule in Sarajevo and the assassination at the corner across the street from the bridge. 4. 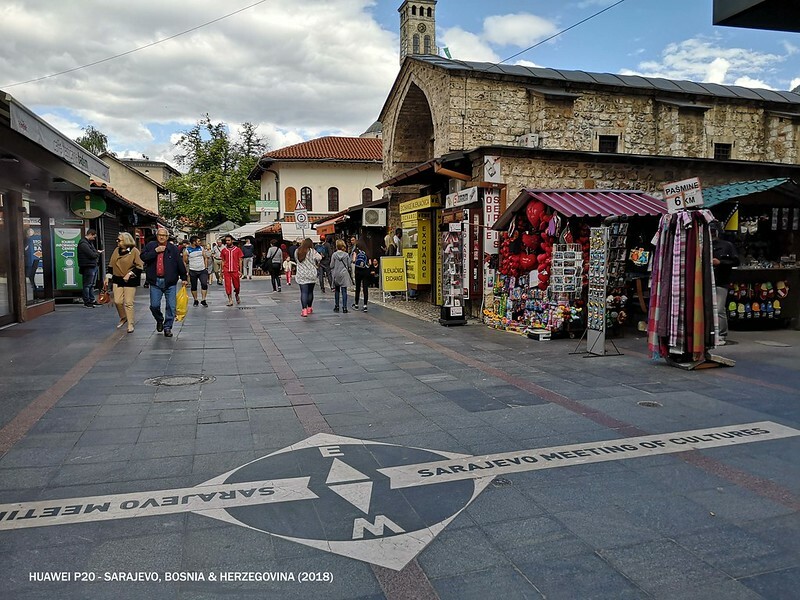 Sarajevo Meeting of Cultures - From this very spot, this is where you can see the meeting of civilisations, represented by a clear dividing line between Ottoman and Austro-Hungarian architecture. 5. Vijecnica (City Hall) - The most extravagant buildings constructed during Austro-Hungarian occupation and it serves as a symbol of the meeting of world civilisations. 6. 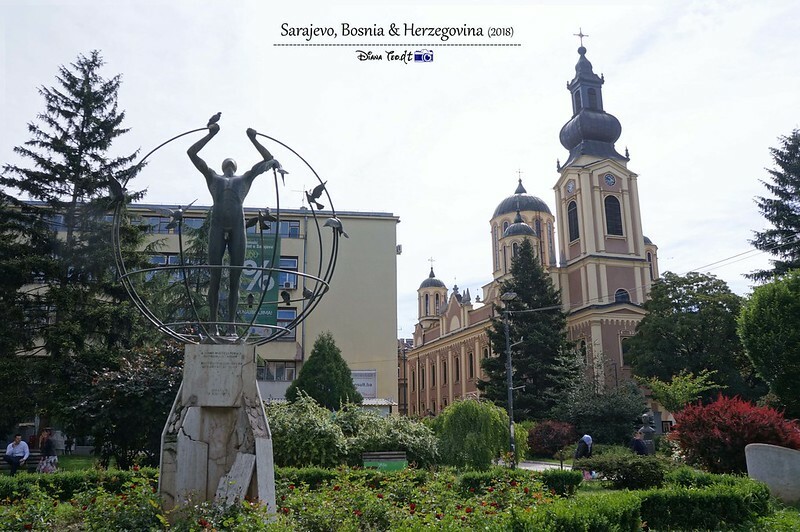 Cathedral of the Nativity of the Theotokos - Besides being the largest Serbian Orthodox church in Sarajevo, it also known to be one of the largest in the Balkans. Right next to the cathedral is the multiculturalism monument. 7. 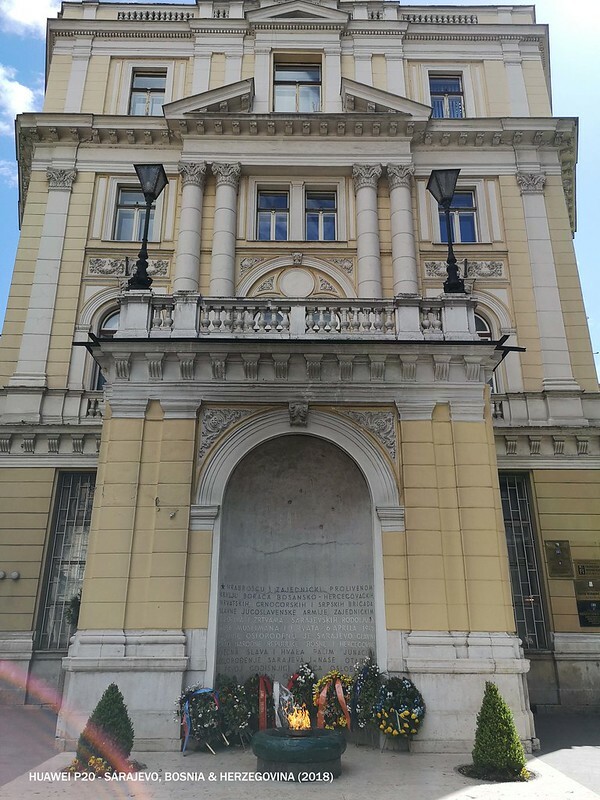 Vjecna Vatra (Eternal Flame) - A memorial to the military and civilian victims of the Second World War in Sarajevo. The flames never stop burning which makes this monument a unique piece of art, idea and dedication. 8. Trebevic Cable Car - After 26 years, this famous cable car is resumed operations and reopened to the public. It links the old part of the city with the mountain Trebevic. The cable car ride costs 20KM (approx. to €10/RM50) for a return trip. 9. 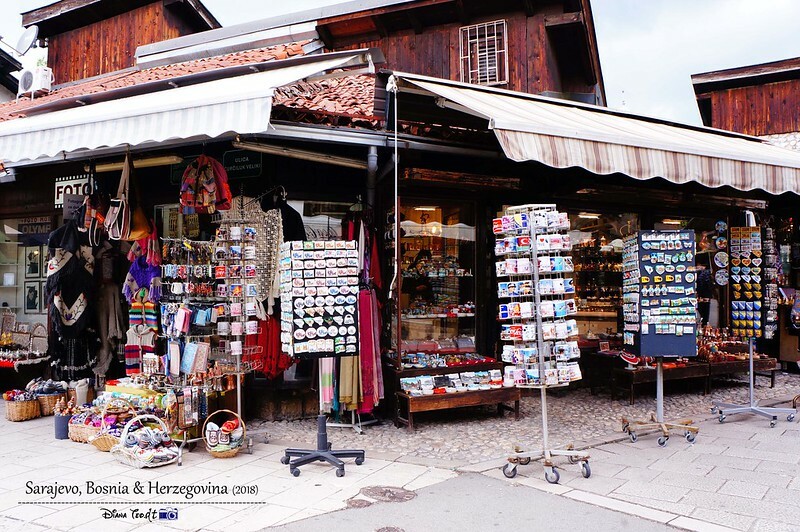 Bascarsila (Old Town) - Sarajevo's old bazaar and the historical and cultural center of the city. 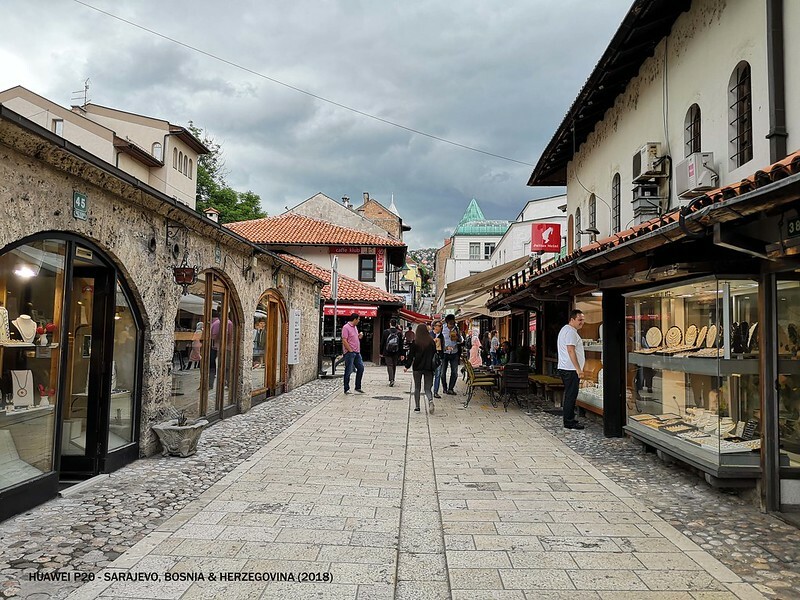 Bascarsila is an oriental bazaar, a maze of narrow streets tucked in the center of the city's heart and this place is an ideal spot if you are seeking for real souvenirs. That's explain why I prefer to stay in the Old Town. 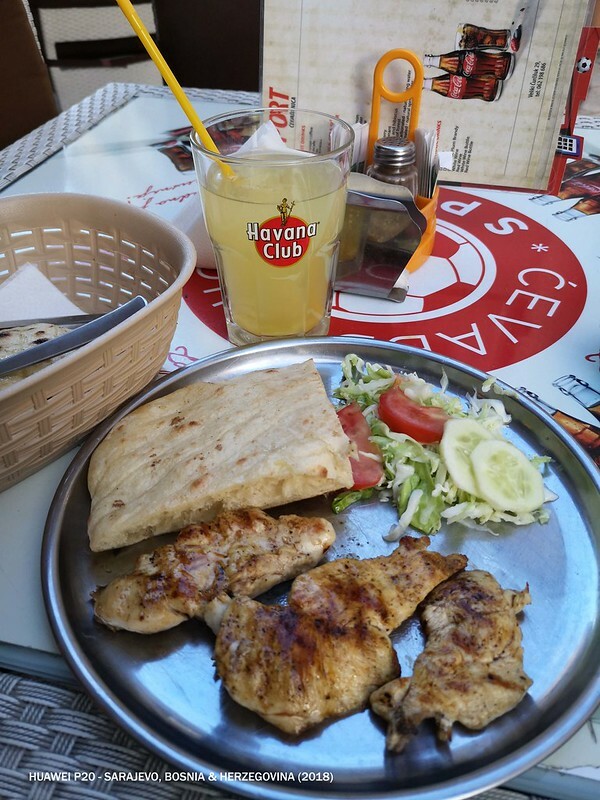 1) Cevapi - The staple food of Sarajevo, it is served with flatbreads filled with grilled dish of mixed meat (the most common to be found in most restaurant and shops are served with beef but can request to serve in chicken, like in my case). 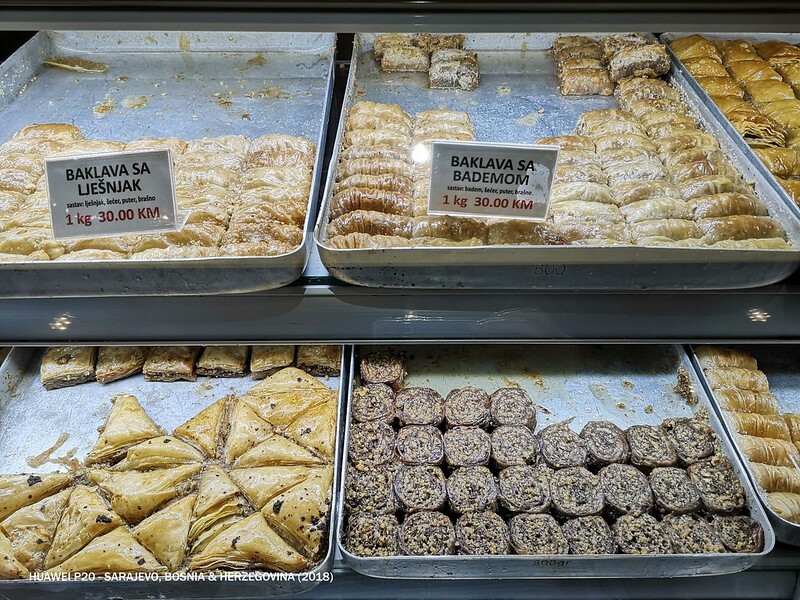 2) Baklava - A traditional Ottoman Turkish sweet pastry often eaten as a dessert. It is a rich, sweet dessert pastry made of layers of filo filled with chopped nuts and sweetened and held together with syrup or honey. 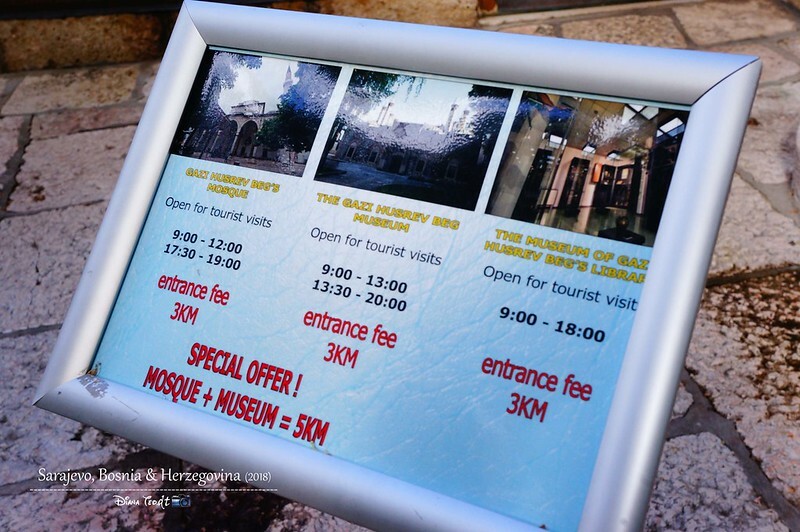 I found out eating in Sarajevo are not that expensive compare to the rest of the cities around Europe. 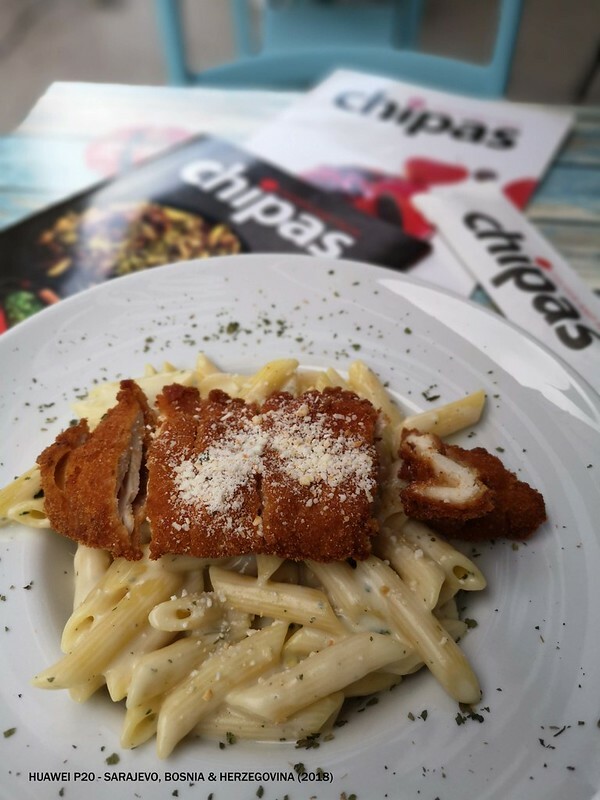 I bumped into a restaurant served chicken with pasta for 4.50KM only (approx. 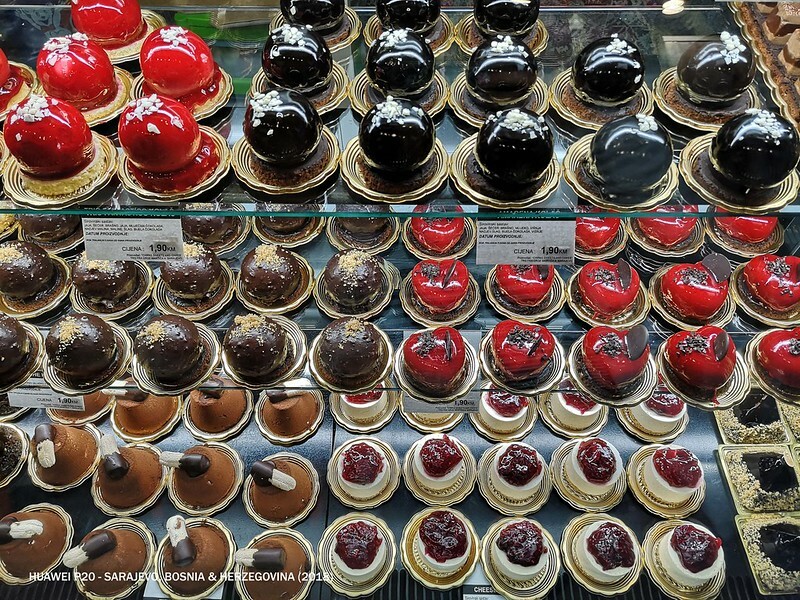 to €2.25/RM6) and look their intricate looking and mouthwatering pastries (as below), it cost 1.90KM only (approx. to €1/RM5). Madness! Regardless whether exchange in the airport, post office and etc, there is a surcharge of 1% commission. So at the end, I received 193.60KM instead of 195KM. 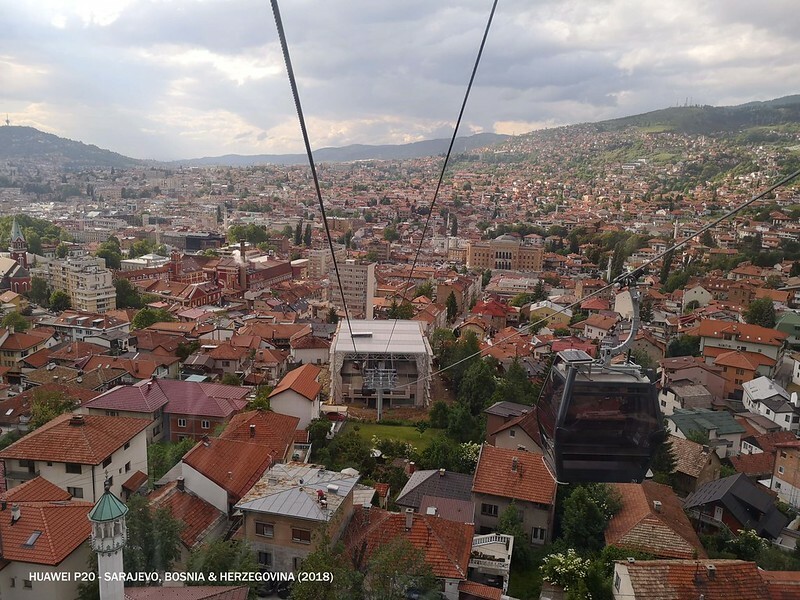 To sum up this trip, I personally never thought travelling around Sarajevo can be that cheap and affordable especially in terms of hostel, food and drinks and local transportation fee. Even fridge magnet cost 2KM only (approx. 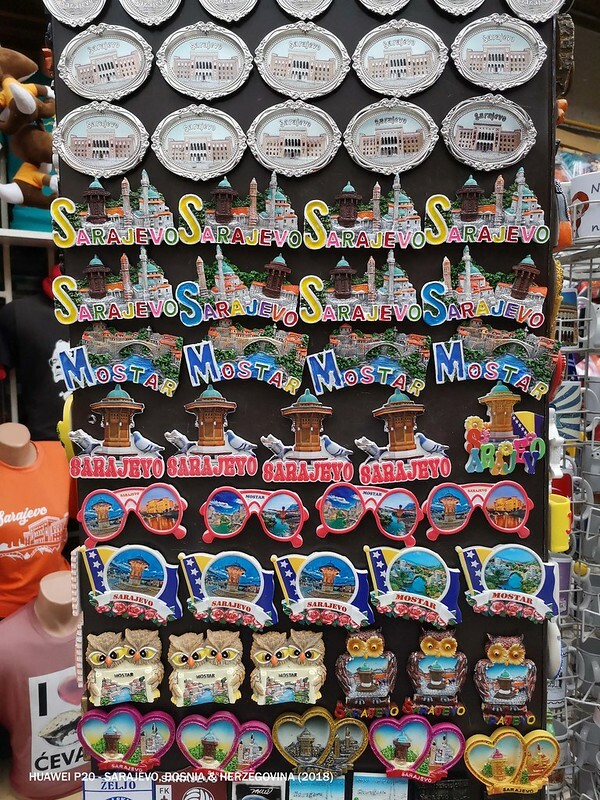 to €1/RM5) per piece and if you are planning to get fridge magnets for friends and family, this is where I would you recommend to buy more cause I found out it is much more cheaper here than Mostar and other parts of Croatia. 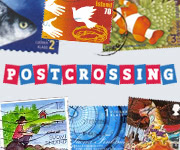 Anyone love postcard like I do? 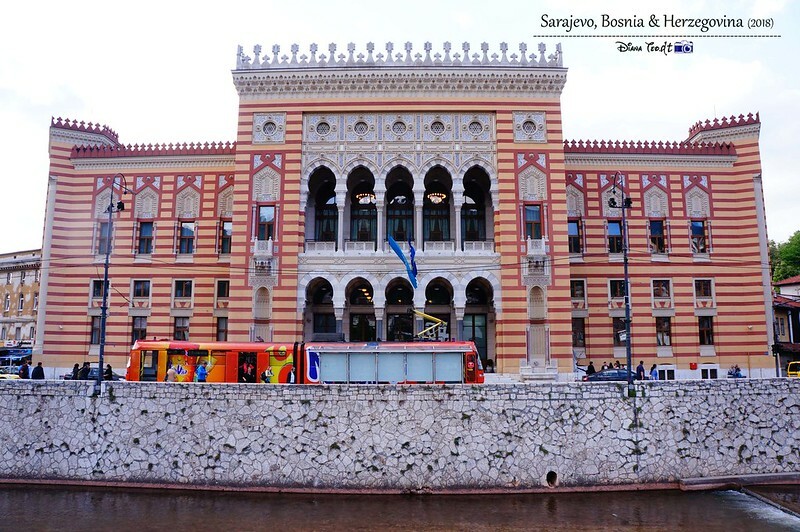 A lady friend that went to Balkans last year was praising on the beauty of the place. So nice to bump into nice local. Bosnian coffee. Must be good. Sarajevo cuisine, I am not so familiar with. Nice! I wanna go there next! ok..one info noted... there is a bus service right from the airport to the city... thanks...hihii... yeah ive been on pegasus like 4-5 times (cnt remember exactly..haha) and so far they never failed me... good and reliable budget airline.